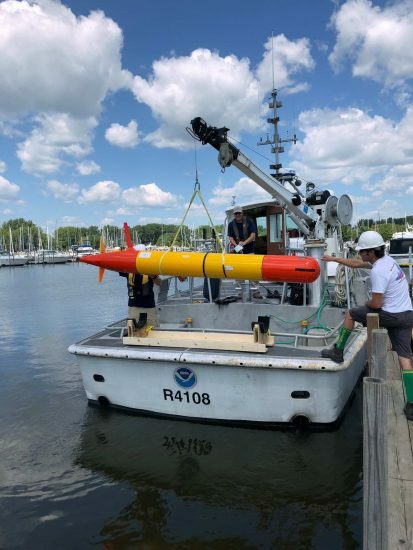 Researchers hoist a long-range AUV onto a NOAA research vessel that will carry it out into the open waters of Lake Erie. 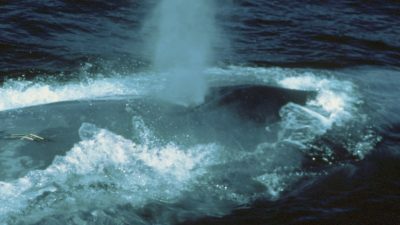 (c) NOAA. Microcystin is a toxin that can cause skin reactions, stomach problems and even liver damage. It is produced by a tiny blue-green algae (cyanobacteria) called Microcystis that proliferates rapidly in warm, nutrient-rich water. Unfortunately, Microcystis in the Great Lakes in the North of the US, which provide millions of people with drinking water, is becoming more common. Researchers at the Monterey Bay Aquarium Research Institute (MBARI) and the National Oceanographic and Atmospheric Administration (NOAA) are testing a new autonomous underwater robot in Lake Erie that measures the amount and concentration of microcystin and algae in the water and transmits its results to land in real time. 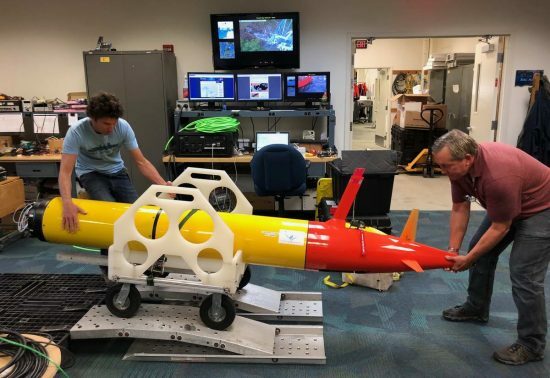 The robot used is a far-reaching autonomous underwater vehicle (LRAUVs) from the MBARI. 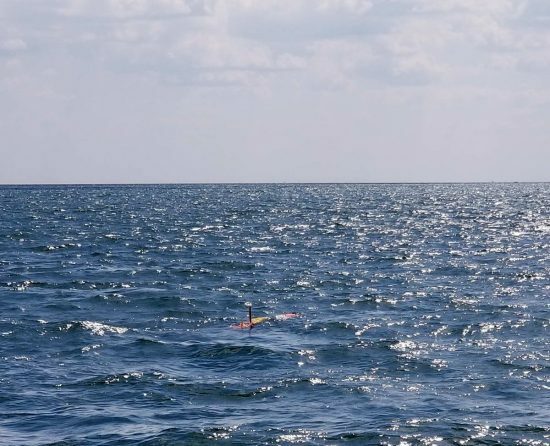 With a diameter of about 30 and a length of 230 centimetres, it looks like a small torpedo, but is much slower and was specially developed for weeks of use in the water to collect scientific data. 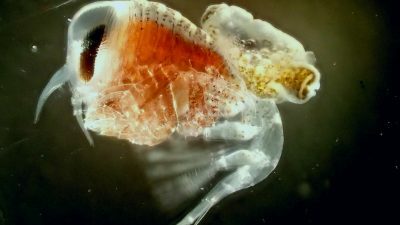 For eight years, MBARI scientists and engineers have been building LRAUVs to study microscopic algae and marine chemistry off the coast of California. In 2018 they built a new LRAUV carrying a biochemical robotic laboratory. This automated laboratory is called the Third Generation Environmental Sample Processor (3G ESP). As the LRAUV moves through the water, the 3G ESP collects water samples, filters them, and then processes them to detect microscopic organisms or toxins such as microcystin. After analyzing the samples, the 3G ESP can send its results to the scientists on land via satellite link. As many cities source their drinking water from the Great Lakes, NOAA makes predictions on where and when harmful algal blooms will produce microcystin. The researchers hope the LRAUV data will help with these predictions. Steve Ruberg, a scientist at the NOAA's Great Lakes Environmental Research Laboratory, explains: "Information on how deep the toxins of a harmful algal bloom go and how close they are to municipal water pipelines can help the NOAA improve its predictions and decision-making tools which the communities of the Great Lakes depend". After launching the LRAUV from a boat, the researchers will return ashore to watch his progress. 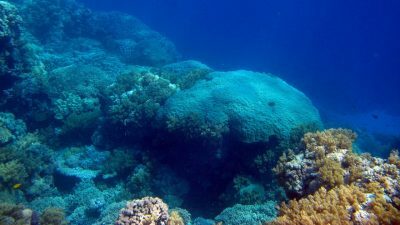 The robot will remain submerged most of the time, but will appear periodically to let the scientists know where he is and what he "sees". In addition, he will also collect and store water samples for later analysis on land. Microbiologists will extract DNA from these conserved samples to find out more about the entire microbial community in the lake. This will help them to understand the conditions that contribute to dangerous algal blooms. 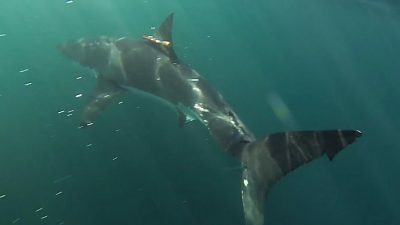 "This approach is unique in the sense that we combine elements of robotics, biochemistry and free-running autonomous systems," says Chris Scholin, president of MBARI and inventor of the Environmental Sample Processor.